Whenever there is an international justice league. The people within it suffer from combat fatigue. No one knows why, not even the spy, whom goes by the name of General McKye. As Written by Dan Jurgens; Drawn by Aaron Lopresti; and Published by DC Comics in November 2011. In this third instalment of ‘The Signal Masters’, we see the Justice League International, spit into teams of two, and carry out a coordinated attack on the four giants robots, whom are situated in four separate counties. Rocket Red and Ice go to Russia, Fire and Vixen go to South Africa, The August General and Godiva go to Canada, and Batman and Booster Gold stay in Peru. Here, at these lo-cal’s, each team find a cave underneath their respective Giant Robots, plus a swarm of savage monsters whom overpower them during their investigations. Oh! There is one proviso though; Batman does manage to trigger a signal before he succumbs to darkness. And as for Guy Gardner on the other hand, well, he goes straight to the root of the problem – a spaceship over Earth – only to be overpowered by the mastermind behind it all, Peraxxus. I liked it when Rocket Red was talking to Ice about his feelings for Fire, stating ‘Da! Would light Rockets Reds rockets!’. Plus, when Booster was in a fight with the monsters, and said to Batman ‘Would’ja hurry up already? One of these guys latched on to a place you don’t want anyone to latch on to – know what I’m saying?’. 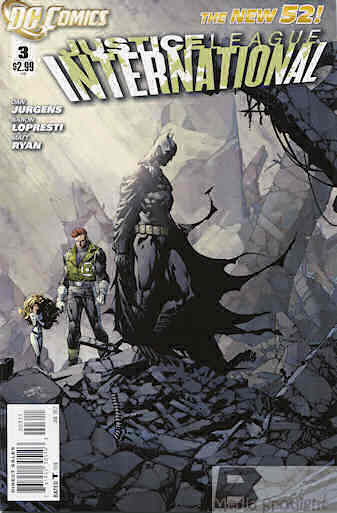 OK, I have to confess, that this incarnation of the Justice League International is starting to grow on me. For a start, the dynamics and the characters on this team are slightly more pronounced – which is nice. Next, I would have to say that the style of this book is becoming much more apparent – simple yet dynamic. And finally, this story arc is becoming a more enveloping one than I thought previously – mainly due to the cosmic and earthy elements. Listen, to be honest about it, in my opinion, Aaron Lopresti’s art on this book is not necessarily my cup of tea – as it come across slightly too ‘Saturday Morning cartoon’ for my liking. Nevertheless, to juxtapose this statement, his characters and his action are very clear, and his panel layouts and compositions are very pleasant to look at. Oh! I did like the David Finch cover – very moody. I liked this issue because it felt better than the previous issues. Now some of this has to do with more character, and some of this has to do with more plot. Overall, though, this issue appeared more confident as a story, and that is what matters, right? Unfortunately, this incarnation of the Justice League International, does feel somewhat bland all in all. OK, so maybe some of this has something to do with its previous incarnation. However, the dynamism and the characters do appear slightly over ‘kiddie friendly’ to me, which does give it a somewhat ‘Disney feel’ in execution. There is a film with Peter Sellers in it called ‘Being There’. Now, in this film, Peter’s character is a simpleton who goes by the name of Chancy Gardner, whom has a simple catch phrase – ‘Yowser’ – seems appropriate somehow. Now in some way, this story feels like a houseplant to me. You know, a simple houseplant, like a... err... green one . Because it is fairly pleasant to look at, does not cause too much fuss, and you hope that it will bloom with vigour in the future. I would have made this initial storyline more edgy and grounded in tone – like Justice League Dark. Also, I would have had a couple of dirty jokes thrown in for good measure (i.e. Does this Giant Robot have a giant joystick? Or is it just happy to see me?). Now even though some of my remarks have not been too kind for this title, I do have to say that this series is getting better by the issue. In fact, if it continues to progress in this manner, I really will be optimistic for this comic books future.